even though the output of Moon of Eris has been going slower than i would like, the piece and its construction has been constantly running in my head. As i struggle to work through the construction and development of the B section and the ending, i find myself thinking about potential influences for how the piece is turning out. What’s clear about this B section that’s under development is that what i’m trying to create is pretty heavily influenced by Ligeti’s 6th piano etude. the climax of the phrase is the culmination of all of these three parts at its lowest metal “pitch” with accents that almost come together in loud form that get bridged by a bowed crotale note by the first player. I’m blogging about this for two reasons: the second is merely to track my headspace on the piece and explore where the first section of the piece comes from because i have no idea where it comes from at all. I blame part of this on how long ago i came up with the material – i was likely influenced by something i heard at the time or maybe was learning – it could have been, for example, the gamelan ensemble that i was in at the time and being in that world of five pitches being used in long cycles. But i don’t know that for sure, and before i started developing this blog entry, the gamelan influence wouldn’t have occurred to me. But the first and primary reason i’m blogging about this is to “talk it out” to help with the writing. Generally with a piece like this i conceive of it as “less is more” when it comes to development materials. As i had stated in a previous blog entry, the piece itself doesn’t feel minimalist to me in the same sense that i’d get out of Terry Riley or Phil Glass, but it has a particular sort of focus to it that has minimalist influences, the idea of capturing a particular moment or phrase and drawing it out and exploring it and having that drive the entire piece. Yet i’m finding that after a couple of iterations and variations of the above material, i’m wanting more as a listener and as a composer, and i’m trying to justify introducing a drastically different variation element to this material in its third iteration before i go all recap of the A section material because there’s a part of me that’s loathe to introduce that if it in itself isn’t going to develop of its own accord. Ultimately, i think that that problem may solve itself if i either conceptually conceive of it as still being close enough to the original material that it’s still just an extension of that material rather than something unique enough that it deserves its own material. It also may solve itself in that i may start to flesh it out and figure out how to develop it in a way that doesn’t detract from the momentum of the piece overall. We’ll see what happens. I already skipped a bit to the ending material of the section so i knew where i was heading – that helps give the section focus, but i just need to keep in mind that the ending material shouldn’t be laid out in stone, that if the section starts to meander in a different place that i should follow where it wants to go as opposed to pigeonhole it into something that i happen to think it should go. That’s always the toughest thing about composing anything, i suppose, the ability to experiment with something like that or run with a large concept and then freely abandon it completely if that’s not where the music is going. beauty…beholder started out very differently in my head than how it turned out, and i’ve been taught and learned for myself that the most important thing to do is to trust my instincts when it comes to that sort of thing. So I generally don’t put a lot of effort into creating MIDI playback files that sound “genuine” for lack of a better term. If, for example, i’m writing a piece for flute, clarinet, violin, and cello, i’ll keep MIDI set on the default piano sound because i use MIDI playback pretty much purely for fine-tuning of pacing, trusting my inner ear to tell me more about timbres and textures, and because having imperfect MIDI representations can sometimes muddy up what i hear in my head as opposed to help it. 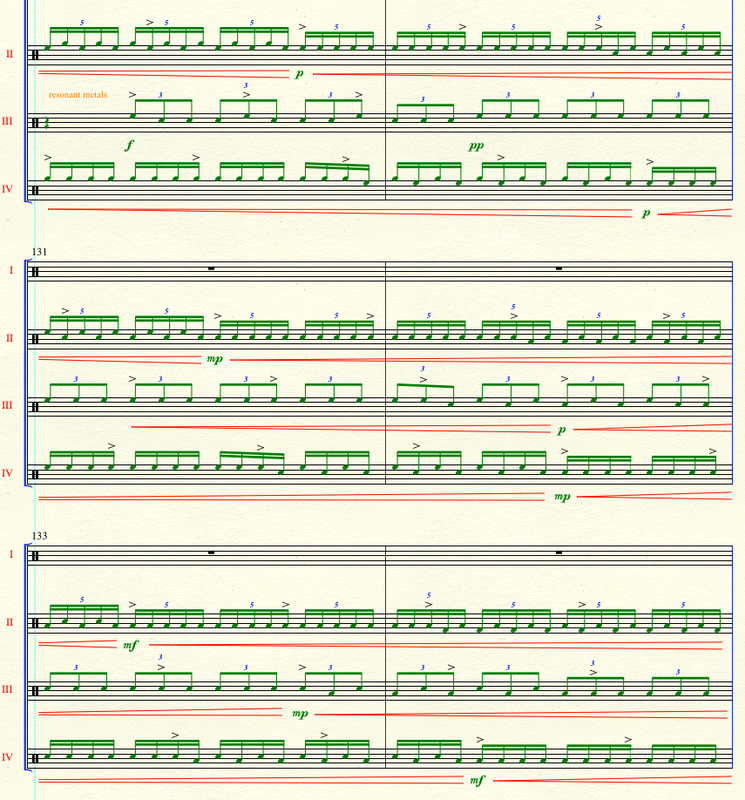 I’ve been doing some heavy work on Moon of Eris, my piece for the Portland Percussion Group, and i reached a point where i was doing MIDI playback a lot to revise and fine tune the pacing. 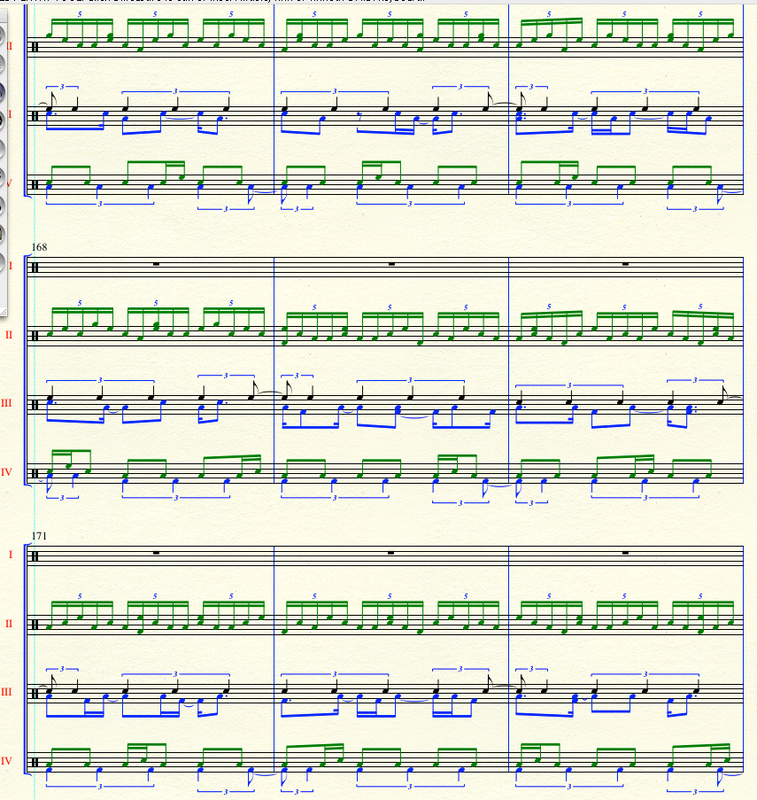 The first third of the piece involves each player playing on four tones of non-pitched percussion instruments (temple blocks, wood blocks, &c.) that I’ve notated on the FACE pitches of the treble clef. As per normal, i have each instrument set on piano for MIDI playback, so when i use playback, i hear a lot of F, A, C, and E running in canon across all four instruments. Usually when i’m deep in a musical project, the piece pops in my head at random times. I’ll be walking around or driving and i’ll hear the piece in my head. In the case of Moon of Eris, what i’ve been hearing in my head lately has been what the MIDI playback sounds like – piano FACE – and rather randomly, my brain has also started to associate harmonic movement with those “false” pitches of the piece. Which is pretty interesting. The nature of the first third of the piece is such that I think it would actually work pretty well as a pitched piece with harmony behind it (fairly canonic, very minimalist), so now i’ve got this thought to create another piece that uses a variation of this material but for pitched instruments. I know that there’s a level of cheating involved with that, but knowing how much Bach, Beethoven, and Steve Reich (as easy examples) constantly rip off their own work, i’ve got no major issues with it.